On the first Friday of February 2018, we are having breakfast with author Lisanne Harrington. Many years ago, Lisanne left the legal world behind forever to pander to her muse, a sarcastic little so-and-so. Only copious amounts of Diet Cherry Dr. Pepper and hamburgers will get him to fill her head with stories of serial killers, werewolves, and the things that live under your bed. She loves to watch reruns of Gilmore Girls, horror movies like Young Frankenstein and Fido, and true crime shows. She likes scary clowns, coffee with flavored creamer, and French fries. Lots and lots of French fries. When not hanging with “The Girls,” she writes paranormal mysteries and murder mysteries. 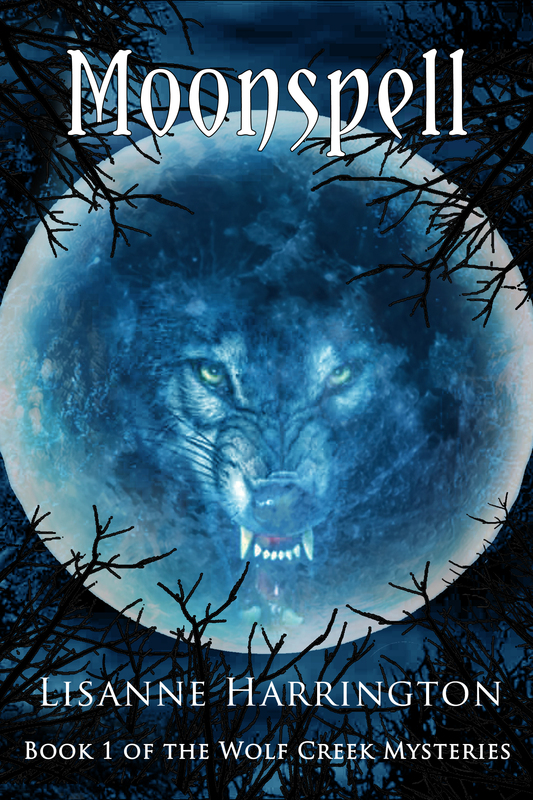 Check out her Wolf Creek Mysteries series (the third book, Moon Shadows, just out! ), and be sure to look for her upcoming murder mystery, Murder in the Family, and newest paranormal story, Gravelings, both due out in 2018. Paperback and ebook editions. For this bright winter breakfast, I’m having half a toasted sprouted sesame bagel with vegan cream cheese and figgy jam, a salad with arugula, papaya, banana, walnut pieces and peach balsamic vinegar and decaf cold brew coffee. Lisanne, what are you having? My morning always starts with coffee. Simply cannot function without it! Heavy on the Italian Sweet Cream. Then I like to eat a lightly-toasted cranberry orange bagel with cream cheese and drink a Chocolate Boost. That’s about as healthy as I eat all day! So tell us about your writing process from concept to draft to revision. Well, let’s see. Normally, I get my ideas while doing mundane chores, like washing dishes or folding laundry. The characters come to me for a chat. They talk to me, sometimes for months before they trust me enough to tell me their story. And I can’t always count on the veracity of their story, either. I’ve found that many times, they fib or outright lie until they’re certain that I will believe them. 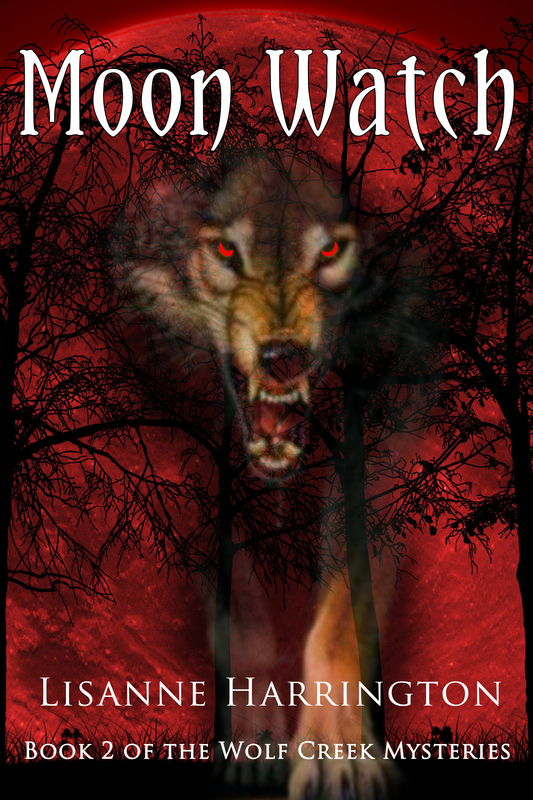 For example, with Moonspell, the first book in my Wolf Creek Mysteries Series, James and Beth took about four months to tell me what REALLY happened to them, and even after I started writing the first draft, the true identity of the werewolf was kept from me until I wrote the final scene. They seemed to take great delight in leading me astray. After getting the first draft down, the characters usually go away. Occasionally, they pop up again to correct something, but not very often. I then comb through the second and third drafts, looking for holes in the story and ways to correct them. The fourth draft usually is for fleshing out scenes and checking for inconsistencies in character development. In further drafts, I fine-tune my writing. Along about now, I read portions of the story to my writing group and deal with their comments. Then, when I think it’s finally done, I send it to my beta reader and nervously chew my nails until she gets it back to me. The next draft incorporates her comments, and more time is spent after that fine-tuning again. I’m a little…shall we say, persnickety…in getting the final manuscript just the way I want it. It really wasn’t up to me. It was James’s idea. He had so much to say. Plus, I wanted to explore some areas of teen life that I was interested in. In Moon Watch, Book 2 of the series, I delve into things like inter-racial dating, bullying, being different, being invisible, being ostracized for making a mistake, sexting, many of the things that happened to me when I was that age. Was it any different now than it had been for me? Not really. 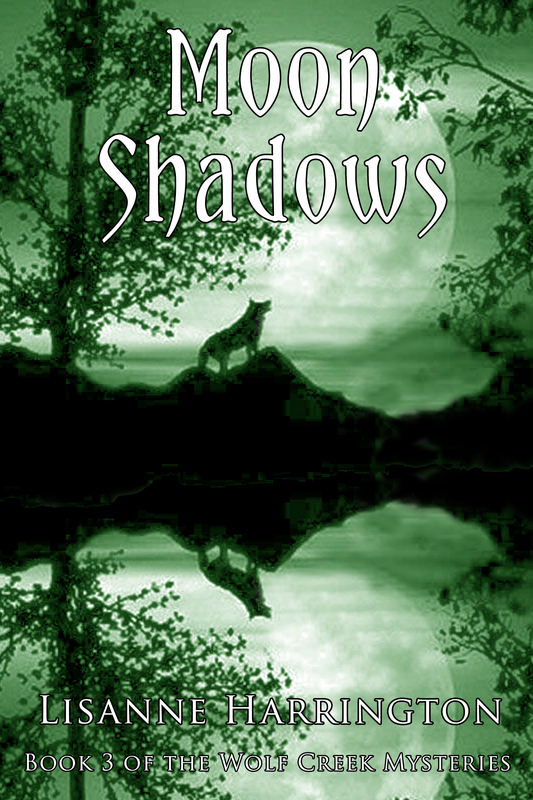 I struggled a bit with the third book, Moon Shadows. James wasn’t very forthcoming about that one. I actually had a different story in mind, had even written over 30,000 words on it, but I realized it just wasn’t working and ended up scrapping everything. So frustrating! And worrisome, since I was now contractually obligated to write the second and third books. With Moonspell, the only pressure I had was whatever I put on myself, but now, there was the additional burden of knowing I HAD to produce something. But I’m pleased with the results. Moonspell will always hold a special place in my heart, being the first book I published. But I have to admit I like James, Beth, and their other stories an awful lot. I love the way stories come to me. Living with my characters for as long as I do before I even put pen to paper (so to speak ☺) is a lot of fun. I get to know them and they feel like real people by the time I actually begin to tell their stories. Most of the time, it’s like I’m simply transcribing what they tell me. I rarely have writer’s block (Moon Shadows was the rare exception), and I think it’s because of the pre-writing I do. My family calls it “going to Mommieland” because my eyes tend to glaze over and it takes calling my name several times before they can get my attention! I struggle a bit with self-confidence, as many writers do, and so for me, the most difficult part of writing anything is letting it go. Deciding what I’ve written is good enough. That’s probably why I go through so many drafts. I want everything to be perfect, so the reader enjoys it and never, EVER feels cheated. Tell us about your next project and when it may be published. I’ve actually got two manuscripts sitting with the publisher. The next one to be published (not sure of a date, but probably late summer or early fall) will be a straight murder mystery. No paranormal beings here! It’s called Murder in the Family. The star of the show is Orange County Deputy Sheriff Dana S. Sinclair, who longs for two things: more action on the job so she can earn a promotion like her father before her, and a better relationship with her estranged mother. When her partner is killed, she wonders how she’ll get along without him. But when her own mother is murdered shortly thereafter and it appears that her dead father has come back from the grave to do it, she does everything she can to uncover the truth. As Dana investigates the murder, she uncovers a plethora of suspects, strange warnings, bizarre happenings that seem designed to drive her crazy, and the truth about her dead father. The next one goes back to my paranormal roots. Gravelings is the story of what happens when a disturbed little girl encounters strange creatures living in the basement. Of course, the adults around her don’t believe her. She is, after all, on medication for hearing voices and other mental health issues. But as the gravelings get more and more aggressive and violent, they begin to wonder if the creatures are real. And if the gravelings are going to kill them. My zombie story, “That Twin Thing” is included in an amazing anthology called Murder, Mystery, and Mayhem, by the OC Fictionaires. Be sure to check it out! Great talking with you, Lisanne! Dear reader, I hope you check out THE WOLF CREEK MYSTERIES. Let me pour us another virtual coffee with Italian Sweet Cream before you rush off to Amazon to buy Moon Shadows. I did! MOON SHADOWS is in production. In 2011, I left engineering to write full-time. Between the years 1992 and 2011, I’ve published 14 stories with Alfred Hitchcock’s Mystery Magazine that have featured the hypochondriac detective Micky Cardex and two stories that did not. The 1998 story “No, Thank You, John” was nominated for a Shamus award. Many of these stories have been included in anthologies and translated in multiple languages. With Neal Shusterman, I’ve also published a science fiction story for the More Amazing Stories anthology (Tor) published in 1998 and co-authored with Neal Shusterman an X-Files Young Adult novel (DARK MATTER) for HarperCollins in 1999 under the name Easton Royce. For Simon & Schuster in July 2012, we published an e-novella UNSTRUNG in Neal's UNWIND world. I have graduate degrees in English and Electrical Engineering. This entry was posted in Food, WRITING and tagged breakfast, Lisanne Harrington, paranormal, Wolf Creek Mysteries. Bookmark the permalink. Great interview! I’m really looking forward to reading both Moon Shadows and Lisanne’s Killer Clown story! Made me laugh, Cary! I can see you standing in line for a killer clown story! Just gotta get a few more blog posts done so I can concentrate on it full-time. I’m pedaling as fast as I can! An entertaining and informative interview. I’m looking forward to reading MOONSPELL. Thank you for your comments, Jean!